From the west coast of the United States to the northern border of Lebanon, training people from local communities to resolve conflict and build relationships in their own neighbourhoods is a powerful tool for peace. Akkar, situated in northern Lebanon, has long been a forgotten periphery where economic deprivation combines with a feudal system of land ownership and tenancy to fuel inequality and resentment. It is home to an eclectic mix of Lebanese Sunni and Shia Muslims, Greek Orthodox and Maronite Christians and the largest population of Alawites in the country. Sitting just across the border from Syria, 80 kilometres from Homs, families live on both sides of the divide and ties to Syria can run deeper than those to Beirut. Strong historical and family links made Akkar an obvious choice for many Syrians needing to flee the violence. But as the number of people seeking refuge in Akkar grew, the already struggling region saw polarisation increase as divisions escalated among communities affiliated with either support to the Syrian regime or to the Free Syrian Army, and long-standing sectarian rifts in Lebanese national politics were sharpened at the local level. 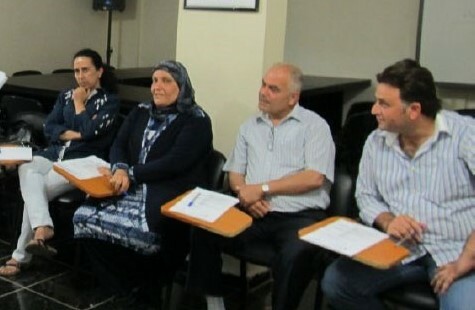 In 2013, the Partners Network teamed up with the Lebanese consultancy, Peace Labz, with the idea to train local conciliators to work within their own neighbourhoods to resolve disputes and conflicts. “The connection came through another member of the Partners Network” recalls Daniela Kolarova, Director of Partners Bulgaria. Partners Jordan suggested reaching out to Peace Labz, who had been working all over Lebanon to diffuse tensions around aid delivery, meeting with people in homes, schools, and cultural centres. “They knew the local issues and communities”. So, when EU funding to support non-state actors in conflict prevention and peace became available, the project fell into place. They did their joint planning over a series of Skype calls and Akkar emerged as the prime candidate. The Partners approach springs from a community mediation programme established in the 1970s on the other side of the world in California. The founder, Raymond Shonholtz, set up ‘Community Boards’ to work on peaceful resolution of disputes and neighbourhood conflicts. At the end of the Cold War, the idea to support local, grassroots initiatives in Central and Eastern Europe was born. Partners Bulgaria, having seen the positive effects in many ethnic communities in Bulgaria in the late nineties and early 2000s, started working to train others to do the same. To get started, they needed to reach out to communities, conducting focus groups in community centres and schools around Akkar. Kolarova remembers the scepticism from local residents in those first meetings: “People were friendly, but you could see they had misgivings. They’ve seen projects come and go. When you’re an outsider, you have to be modest about what you can do”. Rather than taking on the role of mediator, it is a more sustainable model, training local people in conciliation skills, which they can then use to work on local conflicts directly. Finding a trusted group of people willing to act as local conciliators was not straightforward. To work, it needed people from all backgrounds and experiences that people could trust and relate to. It took more than six months to find a good mix of women and men, people of different education levels, in and out of employment, young and old who fitted the criteria. They had to push through favouritism and the inevitable trap of ending up with the usual suspects but, eventually, they found the right candidates. Conciliation, unlike, negotiation is not about getting a deal, but about the delicate art of building relationships and trust. The ‘Local Conflict Conciliators’ facing the people in conflict had the toughest job, sometimes even just to get people in the same room. They were the ones dealing with the emotions and the tensions. “People can see results when they unite around something that’s important for all of them”, says Kolarova. The project’s success relied on maintaining open channels of communication to avoid misinformation. They reached out to local newspapers, sent out communications materials and kept in contact with religious leaders and local officials. Most importantly, the 10-person ‘Supervisory Committee’ in every locality meant that community members felt confident about accountability. The Local Conflict Conciliators project was sufficiently popular and successful that it inspired the establishment of Partners Lebanon, a new member of the Partners Network. Partners Lebanon now works with children from refugee and local communities to strengthen ties between families and communities through music. Kolarova is convinced that what she saw working in Bulgaria, especially in communities with Roma and Turkish populations, can work in all neighbourhoods, with the right approach and understanding of the context. “People forget that they often already have the strategies to solve issues. But living in a situation of conflict has created the feeling of being stuck. Our role is to offer them the framework and techniques to move them forward. In a volatile and sensitive situation, having community teams ready and able to respond to manage the conflicts that arise makes it much less likely that they will escalate into violence”. Interviews and article by Terri Beswick.